Quiet narrow peripheral road leads to the downtown office high building. There two-story private residential houses along the way. The street is narrow for one car only. There are now pedestrian pavements. Sidewalk zone is separated by white lines. Click on the image if you intend to use it. 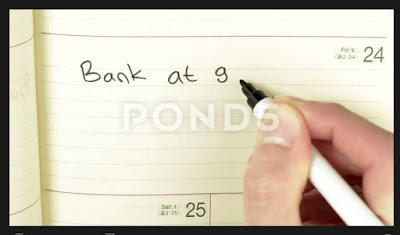 Businessman's hand is recording remainder about meeting in the bank into appointment diary. At now there are a lot of sites to help any business do just that! Set up reminders for just about any task you can think and receive them at work, home, or on the go. Panic attacks student during the exam. He is choosing wrong answers to fill in the blanks of three English sentences. Most people feel tense at this point - it is only natural. If you feel the panic is getting worse – stop, put down your pen and relax. Telemedicine female dermatologist in headset looks at patient skin tags on monitor attentively. Virtual doctor sees underarm acrochordons either by online video chat or snapshot. Horizontal mid-shot on blurry indoors background. Click on the image for details.